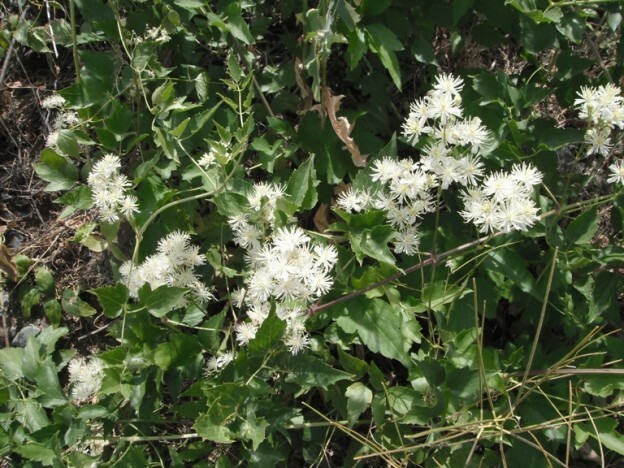 Names: This species is also known as Western White Virgin’s Bower, Creek Clematis, Creekside Virgin’s Bower, Deciduous Traveler’s-joy, Old-man’s Beard, Pipestems, Peppervine, or Yerba de Chiva (Goatbeard plant). “Klema” comes from a Greek word meaning twig or branch. 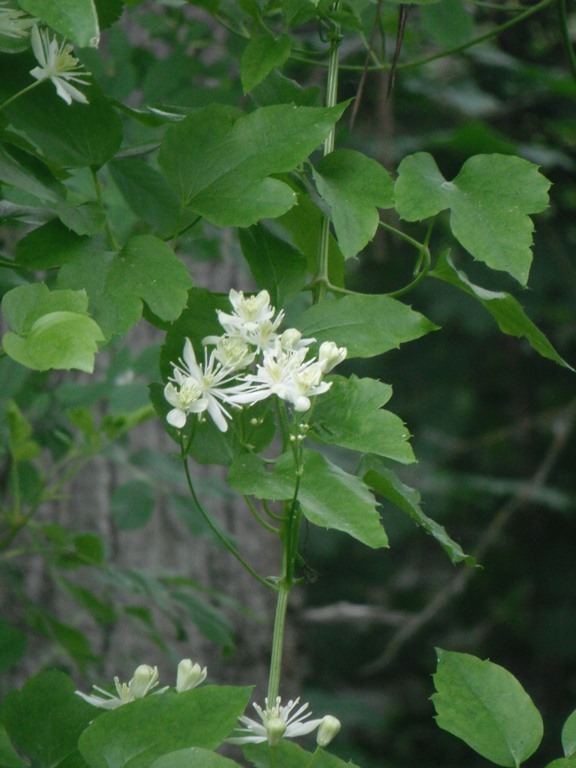 Ligusticifolia refers to its Lovage or Licorice-leaf (Ligusticum)-like leaves. Relationships: There are about 300 species of Clematis, mostly found in temperate regions of the northern hemisphere; most are climbing vines; with about 30 native to North America; and 5-7 species in the Pacific states. Many species and cultivated varieties are grown for their attractive flowers; some have escaped cultivation. Distribution: Western White Clematis is found throughout much of western North America. In southern British Columbia and Washington it is mostly an eastside species, but it can be found on the west side in a couple of southern Washington counties and in Oregon. It is found throughout much of California into northwest Mexico. Growth: Western White Clematis is a climbing vine with stems often to 18 feet (6m), but they may climb up to 60 feet (20 m). Habitat: It often grows along creek bottoms, forest edges, riparian thickets, and in Ponderosa Pine forests and sagebrush deserts. Wetland designation: FAC-, Facultative, it is equally likely to occur in wetlands or non-wetlands. Diagnostic Characters: Opposite leaves are pinnately compound with 5-7 leaflets. Leaflets are coarsely toothed, sometimes lobed or entire; the petioles persist, acting like tendrils. Clusters of white flowers arise from the leaf axils; male and female flowers on separate plants. Flowers lack petals but have four showy sepals. Female flowers have numerous sterile stamens. 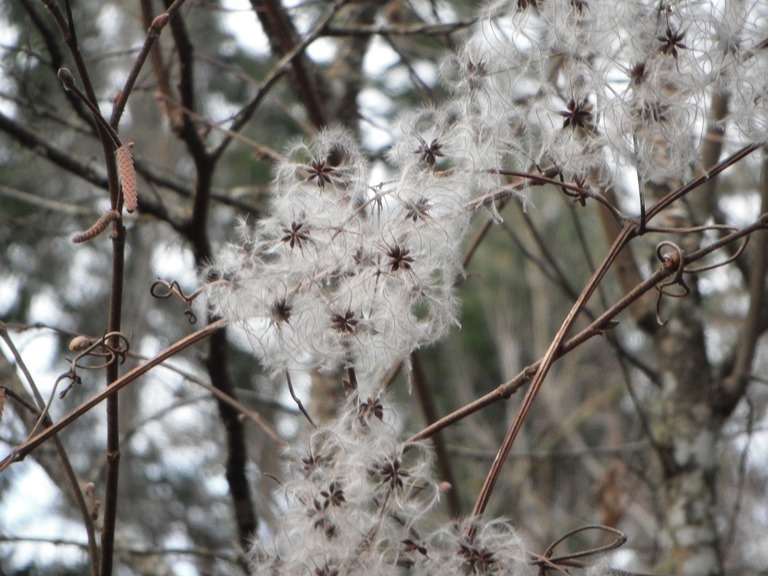 Fruit are silky, feathery achenes in clusters that are likened to an “old man’s beard” or a goat’s beard. In the Landscape: Western White Clematis can be used in the landscape just as are ornamental varieties. It can be trained on a trellis or allowed to climb a tree. It has attractive white flower clusters; and interesting fluffy seed clusters. It is drought tolerant and may be useful for erosion control and hillside plantings. The silky, feathery achenes or “seed floss” of clematis. Propagation: Although most clematis species require 60-180 days of cold stratification, Western White Clematis seeds do not appear to require a prolonged stratification period, but are best soaked in a 0.001M solution of giberellic acid or water. Softwood cuttings are the easiest method; for quickest results they may be treated with a 3000 ppm IBA, and then placed in a misting chamber with bottom heat. Hardwood cuttings are also possible with variable success. Use by People: The seed floss has been used by natives as tinder for starting fires, as insulation in shoes, and as an absorbent in baby diapers; the stems to make carrying nets and bow strings; the roots to make a shampoo. An infusion or poultice of this plant was applied to sores, wounds, bruises, swellings, painful joints, and was also used to treat chest pain and backaches and to treat horses and other animals. Crushed roots were reportedly placed in the nostrils of tired horses to revive them. 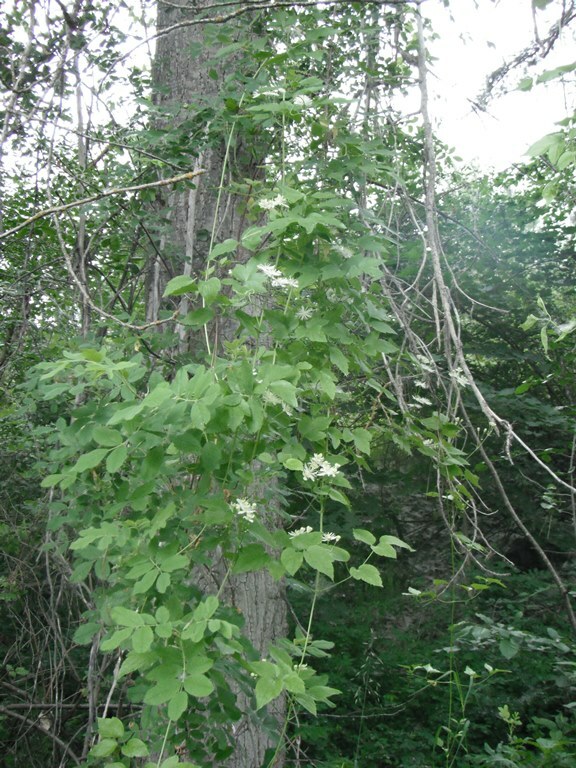 Stems and leaves, which have a peppery taste, were chewed for colds or sore throats. According to one source, “there are no reports of toxicity for this species, but many members of this genus are mildly toxic.” Another source states that all parts cause a burning sensation of mouth and mouth ulcers if eaten and skin redness and a burning sensation if touched or inhaled. 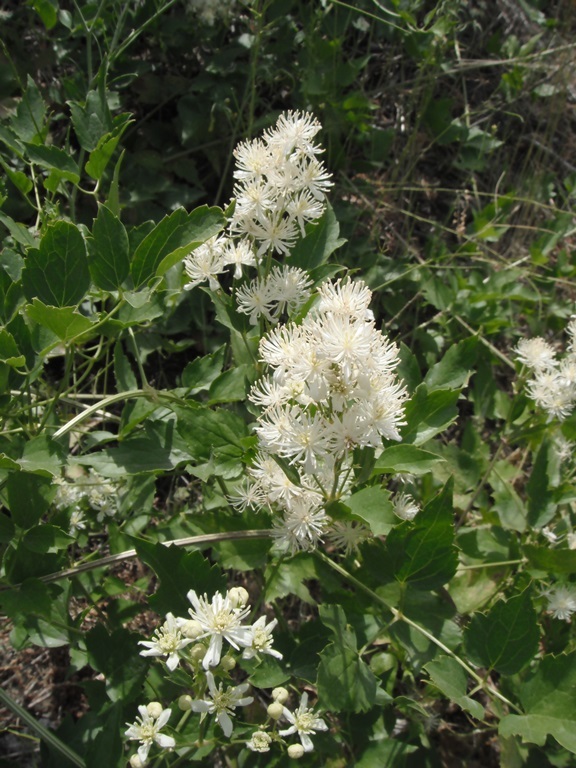 Use by Wildlife: Western White Clematis attracts birds, hummingbirds, and butterflies. Small birds and rodents use the canopy for cover. Birds like to nest in the thick, tangled vines and the fluffy seeds heads seem a perfect material for lining nests. Flowers are pollinated by bees and other insects. This entry was posted in Deciduous Shrubs & Vines on January 4, 2016 by habitatdana.